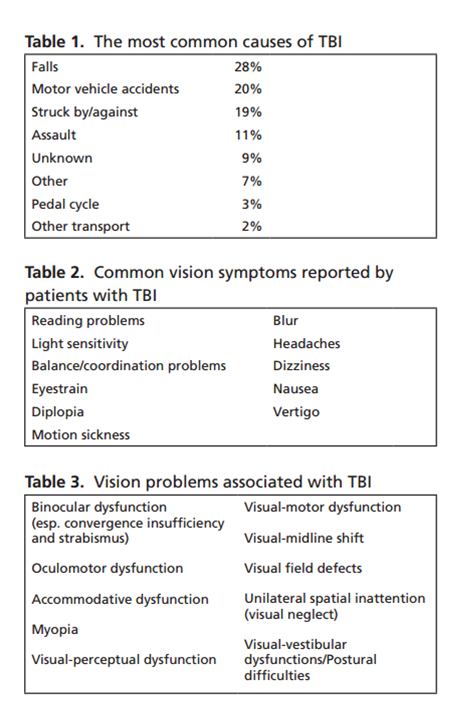 A case study on the effects of vision therapy even 11 years after a car accident that caused a brain injury and resulting vision problems was presented in the journal Optometry and Vision Science. The study shows that accident victims that have suffered brain injuries experience a decreased quality of life when vision problems result and persist for years and, in this case, over a decade. It also shows that treatment with vision therapy is probably never too late and can be a great benefit to the patient. The subject of the case study is a 28-year-old Caucasian male who was evaluated for vision problems that started after he acquired a traumatic brain injury (TBI) during a car accident 11 years previously. According to the study the patient had "numerous symptoms including reading difficulties, ocular pain, headaches, and difficulties with depth perception. The evaluation revealed binocular vision, accommodative, and oculomotor dysfunctions, as well as reduced peripheral visual awareness and visualization anomalies." The patient was treated with weekly office-based optometric vision therapy (OVT), home-based syntonics, primitive reflex integration, and single vision lenses with base-in prism. the patient reported significant improvement in symptoms. To find a doctor near you who can can treat the vision problems that result form brain injuries visit the website of the College of Optometrists in Vision Development here. Retinal tear - what does it mean?